As a working mom of a 3-year-old whose belly I try to fill with only all-natural meals and snacks, finding a great freezer-friendly recipe is like hitting the mom lottery. 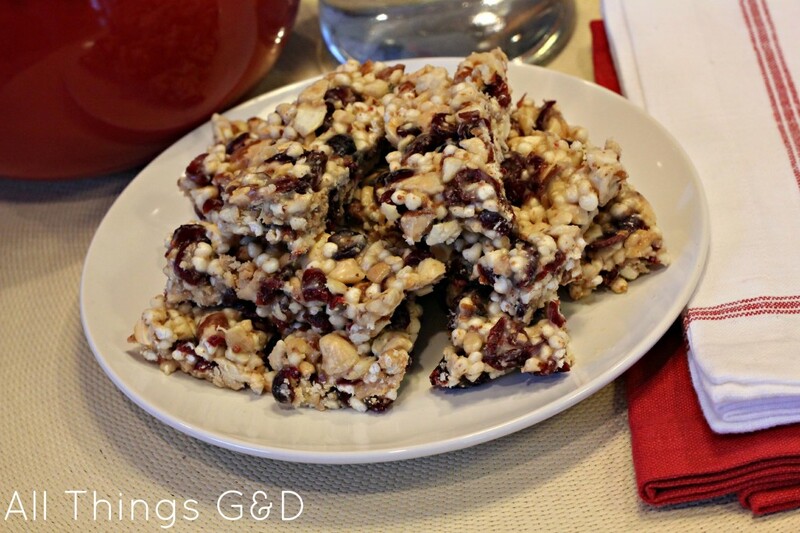 That’s just one of the things I love about these No-Bake Cranberry Nut Bars! They’re also healthy, taste delicious, and are a great grab-and-go snack or quick and easy side for a meal. Kate loves getting KIND bars when we’re on the go (one of the few things that comes in a wrapper that I’ll let her eat) – but they’re pricey. The ingredients are refreshingly simple (usually nuts, fruit, and honey) so I hit up Google to research some homemade KIND bar recipes. I settled on the recipe below (adapted from Delighted Momma) because of its short list of simple ingredients. They’re a little softer and creamier than a KIND Fruit & Nut Bar, but they’re equally as good! 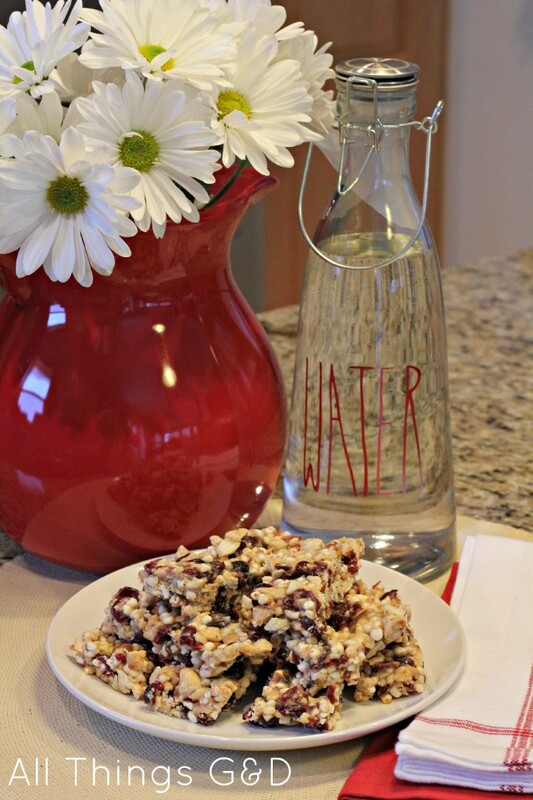 Mix together chopped nuts, puffed millet, and dried cranberries. Stir in honey until well-blended. Add coconut butter; mix well. Press mixture evenly into an 8×8 pan and refrigerate until firm. 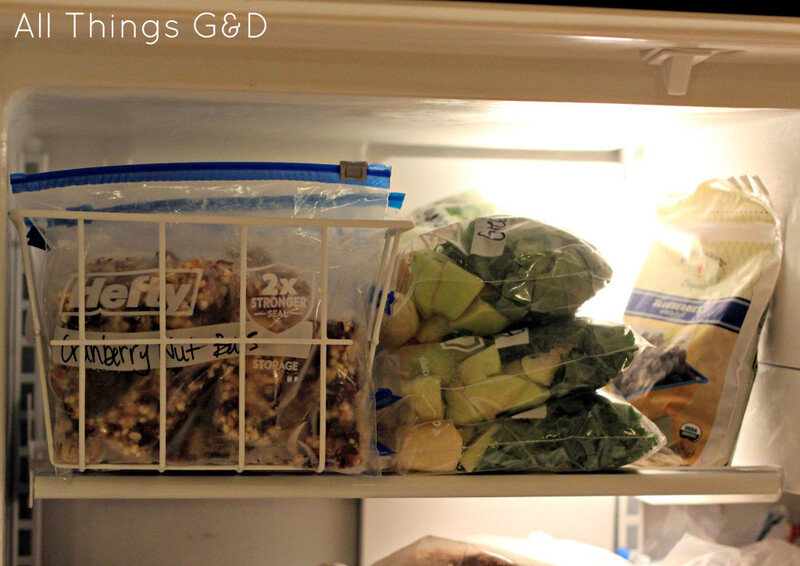 Cut into bars and keep refrigerated (or freeze) until ready to eat. I use almonds and cashews for my mixed nuts (you can use whatever you’d like) chopped in a food processor. You can substitute the dried cranberries for dried blueberries, apricot, raisins, etc. to play around with the flavor. The puffed millet is optional, but I like to add it for a little extra texture and whole grains. If you don’t add the puffed millet I’d recommend reducing the amount of honey you add so the bars aren’t too sticky. 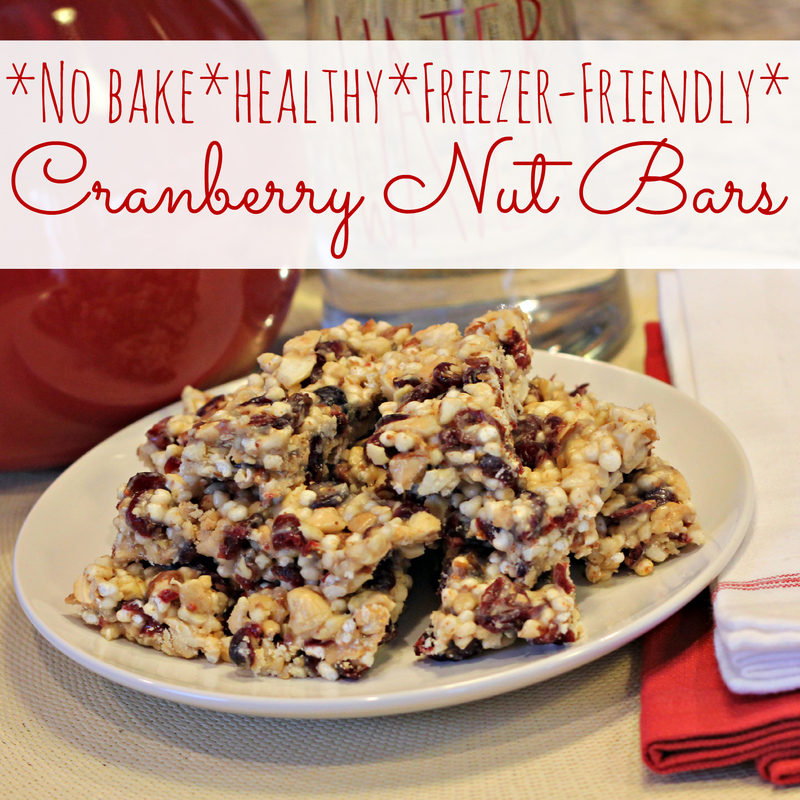 Kate prefers to eat these cranberry nut bars straight out of the freezer – no thawing necessary! These No-Bake Cranberry Nut Bars can be enjoyed straight from the freezer – no thawing necessary! A great option for a homemade KIND bar! These sound like a great idea. And I’m pleased to report that if I were to have taken a picture of my freezer this morning, it would also show several bags of prepared green smoothie fixins. I prepped all of my kale-parsley-banana-apple ingredients last night and bagged ’em up. I actually blended the first batch last night and refrigerated it so that it’d be ready to go for this morning. It was fantastic, and a delightful way to start the day. I’m so excited about this! Thanks for the inspiration. I was bagging up green smoothies yesterday too, jbhat! Soul sisters. I couldn’t figure out how to leave a comment so forgive the butting in. I love this idea but I don’t love the idea of freezing in plastic. I guess with BPA Free bags from Whole Foods it wouldn’t be so bad but I have yet to find an alternative to plastic bags. I flash freeze bananas and then put them in plastic, but I am not a fan of straight freezing in plastic. Any suggestions? LOL, no worries, girl! I could be off on this, but I seem to recall reading that the dangers of freezing in plastic only apply to freezing hot things in plastic. 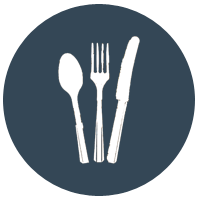 Either way, glass is a good plastic-free alternative if you have space in your freezer for it. I use glass canning jars (they make freezer-friendly ones) for other things like soups and that works well. I also did an amazon search for BPA-free freezer containers and there were a lot of great results: BPA-Free Freezer Containers Hope this helps! What could I substitute for coconut butter? Almond? Peanut? Not sure what the consistency of coconut butter is like. Thanks again! Can’t wait to try these. I can’t remember where I found my bag of puffed millet (I think my local food co-op) but I’m sure Whole Foods carries it. TJ’s too, probably. I found it in the cereal aisle next to puffed wheat and puffed rice (i.e. rice krispies) cereals. What is puffed millet and where do you get it? Also, where do you get almond butter? This recipe calls for coconut butter (not almond butter, which is much different). I’m pretty sure I found mine at Trader Joes, and I’m guessing Whole Foods carries it, too. I used Kashi 7 whole grain puffs cereal! Awesome results! I am a huge nut (pun not really intended) for granola bars, and I also quite like the KIND bars, so this is a great substitute I’ll have to try! I’m thinking they might be great with some white chocolate chips added in too. Mmm…that sounds like a great addition, Heather! Just made these, and they are good but next time I would only use about half the honey, just very sweet. otherwise great and easy!!! Hi! This recipe sounds awesome and the bars look delicious! Have you heard about sprouted nuts? Supposedly the nutritional value is supposed to increase with soaking raw, unroasted nuts overnight and its also supposed to make for easier digestion…. Hmm…I’ve never heard of sprouting nuts, but I do have a cashew dip recipe (from Whole Living) that calls for soaking cashews before you blend them up. It’s amazing! I didn’t know that made the nuts even more nutritious – thanks for the tip! I was super excited to make these bars because i love Kind bars so much, the only thing is that my bars just fall apart even right out of the freezer, am i doing something wrong? And is there a certain type of honey you prefer to use? I found the one i used might be too sweet for me. @Liz – I use a local brand of honey. I’d recommend trying less honey next time, or adding more nuts, millet or other filler. Hope that helps! Love these, but I agree. Less honey is best :). Thanks a million!